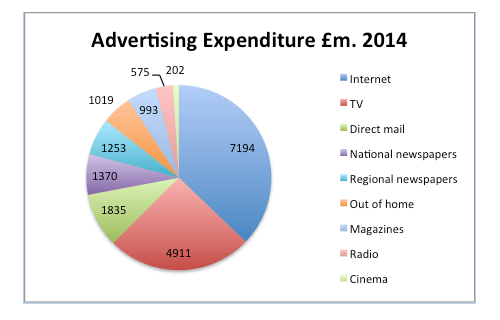 At the end of last month the UK Advertising Association and Warc published their latest expenditure report. The good news UK advertising is growing strongly – up 5.8% overall in the first half of 2015 to £9,424 million. Remember that advertising pays for the majority of print, so healthy advertising growth is good news in principle. However…. This month’s blog comes in the form of two charts. The first shows the split between media of the total £18,553m. The Internet [laptop, tablet and mobile] takes the biggest chunk by far, followed by TV – still a very strong player. Third biggest comes Direct Mail [hurray] then the newspapers [including their digital revenues], out of home, magazines [including their digital revenues] and finally radio and cinema. 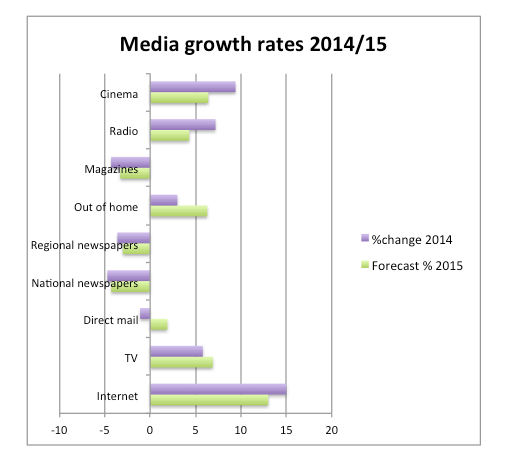 However a somewhat different picture emerges if one looks at the rate of % growth/decline of the various media. The growth of the Internet is remorseless - Mobile spend grew 50.9% in Q1 to reach £502m for heavens sake…TV, Radio and Cinema also show strong consistent growth. Of the print media – magazines, newspapers [regional and national] show relentless decline – with only modest digital gains not offsetting print losses. Out of home [outdoor and retail POP etc] shows good growth and Direct Mail shows some sign of recovery. So it is these last two media that print must rest its hope for protecting some market share. What prompted me to write this blog is the tendency of the print industry media to grasp at any straws that give comfort to print eg ‘direct mail shows there is life in print’. This reminds me somewhat of those that deny climate change and search the statistics for anomalies in the upward trend in temperatures and reassure us that all will be well. The first step to developing a better future for print is to face up to and accept the strategic earthquake that is digital communications. Digital media will increasingly dominate and if print is to thrive it will be in ways that complement digital communications, not compete with it. There are many fresh print applications that use the very digital technologies that have undercut conventional print – we must explore and adopt these with enthusiasm. Drupa has just published a report that we at Printfuture have written on such new print applications and how best to exploit them – Touch the future, Applications that create growth. The executive summary is available free on the drupa website.